This is the poster for the movie. 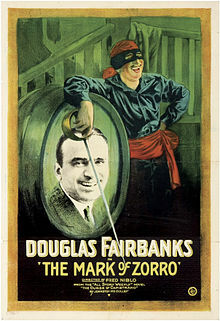 The Mark of Zorro is a 1920 silent movie. It stars Douglas Fairbanks and Noah Beery. This "swashbuckler" adventure was the first movie version of The Mark of Zorro. It was based on the 1919 story "The Curse of Capistrano" by Johnston McCulley. This book introduced the masked hero, Zorro. The screenplay was adapted from the book by Fairbanks (as "Elton Thomas") and Eugene Miller. The movie was produced by Fairbanks for his own production company, Douglas Fairbanks Pictures Corporation. It was the first movie released through United Artists. This company was formed by Fairbanks, Mary Pickford, Charlie Chaplin, and D. W. Griffith. The movie has been remade twice, once in 1940 (starring Tyrone Power) and again in 1974 (starring Frank Langella). This page was last changed on 27 September 2014, at 22:14.